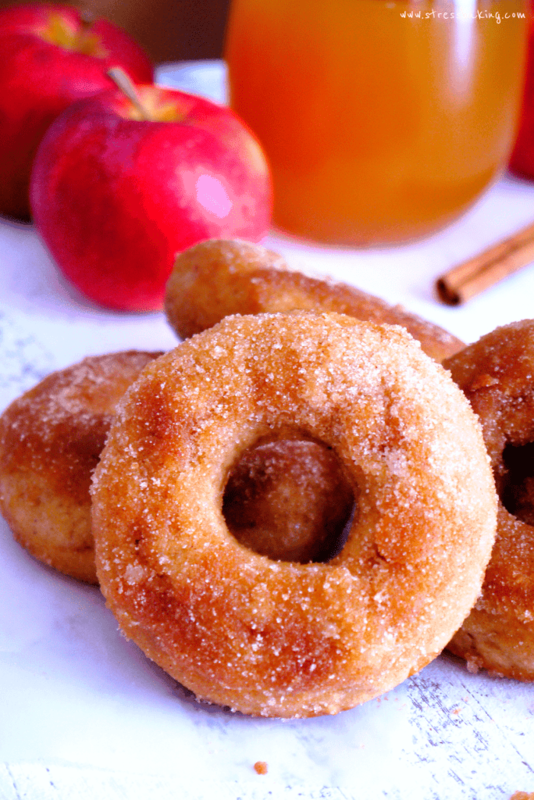 A classic fall favorite, these apple cider donuts are coated in cinnamon sugar and baked – not fried! So I was definitely late to the game on the apple cider donuts this year. But in my defense, our house is only a couple miles from a wonderful apple orchard where they’re already made for me (and it gives me an excuse to go see the animals and pick up enormous bags of fresh apples). Thankfully, my tardiness does not affect how good these are. Some friends and coworkers said, “You should sell these!” Now, I’m not going to sell them – but I will tell them how to make them yourself. 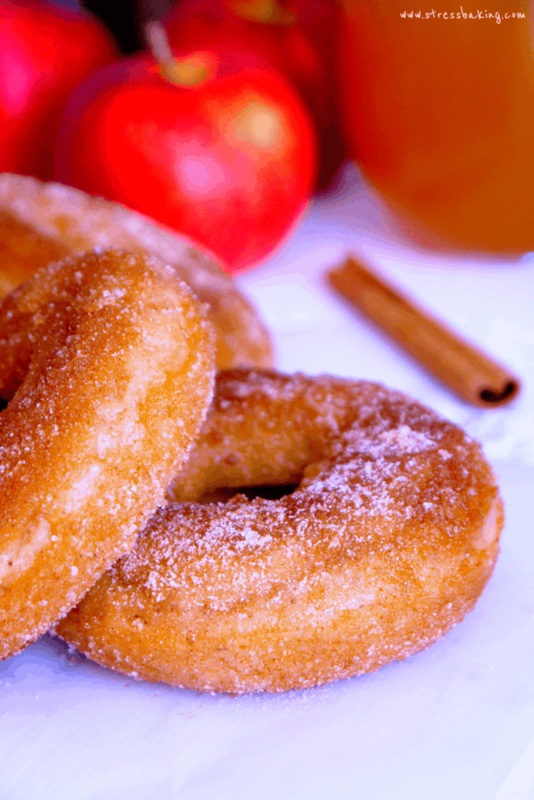 If you have self-control — unlike me — you can devour them plain, without any cinnamon and sugar. 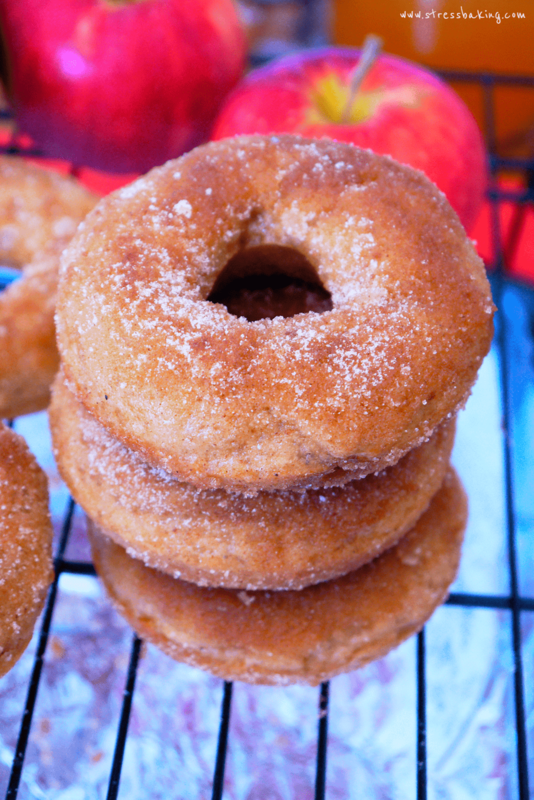 I’d recommend adding just a bit more cinnamon to the tops of the donuts after you’ve poured the batter into the pans just before you bake them if you’re going to do this, just to give them a little bit more flavor. They’re sturdy on the outside, but soft on the inside with a fantastic aroma that makes you want to cozy up with a good book. It’s intoxicating, really. But if you’re more my speed and want to slather everything in sugar, these are just perfect. Not to toot my own horn or anything, but… well, yes – I do want to toot my own horn. I’ve seen many recipes that included nutmeg and cloves and I didn’t include either. I wanted the cidery goodness to be the showstopper here, and not cover it up with spices. I would only recommend storing them for about a week, but who are we kidding here – you’ll finish them long before that. Preheat oven to 350° F. Spray donut pan with nonstick spray and set aside. In a small saucepan, combine cider and cinnamon stick – simmer over low heat for 15 minutes. This should leave you with around 1/2 – 3/4 cup of reduced cider. Set aside and allow to cool. In a large bowl, combine flour, baking powder, baking soda, cinnamon, and salt. Set aside. In a medium bowl, beat egg with whisk. Add melted butter and sugars and whisk until smooth. Add in buttermilk, vanilla, and reduced apple cider and whisk until well-combined. Pour the wet mixture into the dry mixture and whisk together until just combined – do not overmix. Pour the batter into the prepared pan, filling each 2/3 full. The easiest way to fill them is to use a pastry bag (or a plastic bag with a hole cut into the corner). Make sure to wipe the pan of any excess batter! Bake for 10 minutes. Remove from pan and let cool on wire racks. Place melted butter in a shallow bowl. In a separate small bowl, mix sugar and cinnamon. Dip donuts in melted butter, then coat them in the sugar mixture. Set each coated donut on a lined baking sheet to cool and dry. They’re best served the same day, but you can store them in a closed container for up to 5 days. Enjoy! Should you need to make your own buttermilk, just fill a measuring cup with 1/2 cup of regular milk and add a teaspoon of either white vinegar or lemon juice. Let it sit out for about 10-15 minutes and you’ll notice it start to curdle. Stir it a couple times, and then add it in when needed. I never, ever buy buttermilk because I don’t use it often enough to justify the purchase, so I do this all the time. Note: This post was originally published in February 2014 but has since been updated with revisions for clarity and to include shiny new photos.